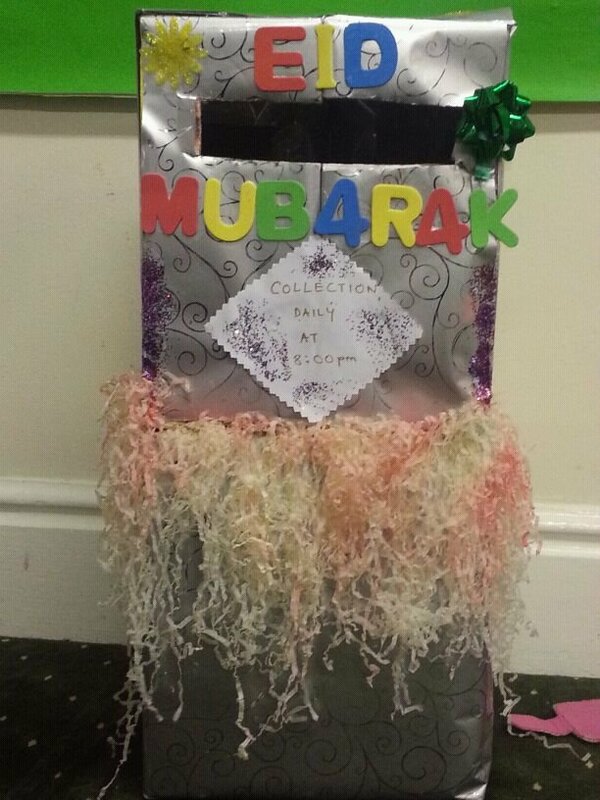 Sooo check this great idea out…an Eid Post Box for the children at mosque! Similar to the Christmas post boxes at school, this is another fantastic way to get them excited about Eid! The children are going to make Eid cards all together in class, others are making their own at home too, some are buying them – they are then posting them into this postbox and it is going to be ‘collected’ and distributed. The teachers are also giving Eid cards out to ensure every child gets at least one! Although my son is excited about the prospect of sharing his celebration with his school friends by giving the Eid Kidzz Cardzz out (on Eid ul Adha as school will be open then), he was disappointed that he wouldn’t have a ‘Post box’ at school to put them in as they only have one up at Christmas. Inshallah with more ideas like these, we can provide more and more alternatives for them to enjoy and look forward to!